Olive: Can I get the, uh, waffles? And, um, what does “a la mode-y” mean? Diner Waitress: Oh that means it comes with ice cream! 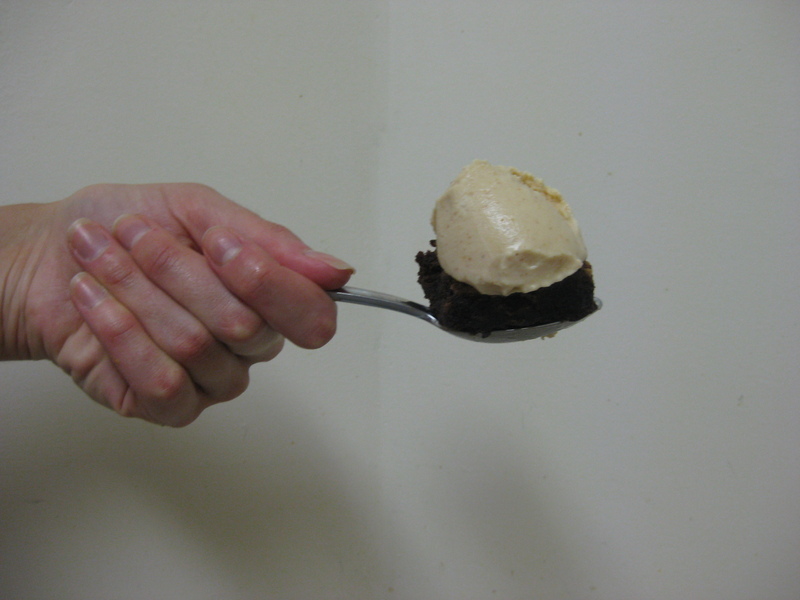 Shall I spoon feed you brownie a-la-mode? I rather dislike peanut butter flavored things. Recently someone asked me to create peanut butter banana ice cream. I nearly laughed in that person’s face. I hate nothing more than bananas. Ew. Then top it off with peanut butter? Fuhgettaboutit. Alas, this week I found myself making peanut butter ice cream. I guess I can’t personally be a huge fan of every flavor, or else this would not be 365scoops, it would simply be me eating chocolate and caramel ice cream, by myself, day in, and day out. Enter this week’s peanut butter concoction. Woah. Rudie Tudie. Who woke up on the wrong side of the bed? Ohy. Great. The only golden rule of 365scoops is that I will not make duplicates, and here I am, being asked to make peanut butter ice cream, again. I figured I’d honor the peanut butter request, but create something slightly more original. And then it came to me. The Brother In-Law loves my peanut butter fudge brownies. I might as well make those with peanut butter ice cream a-la-mode. Done and done. Channeling Sandra Lee semi-homemade I decided to cut corners and use a box of double fudge brownies as the base. You can definitely make your own fudge brownies from scratch, but I was in a slight rush. I did, however, make the peanut butter swirl myself. Oh, and my most proud moment was creating this ice cream recipe from scratch. The Husband and The Brother-In-Law loved it. Prepare the brownies according to the box (make sure to make them fudgy, not cake-like). Pour the brownie mixture into an 8×8 baking pan. Spoon 9 globs (a very professional word!) 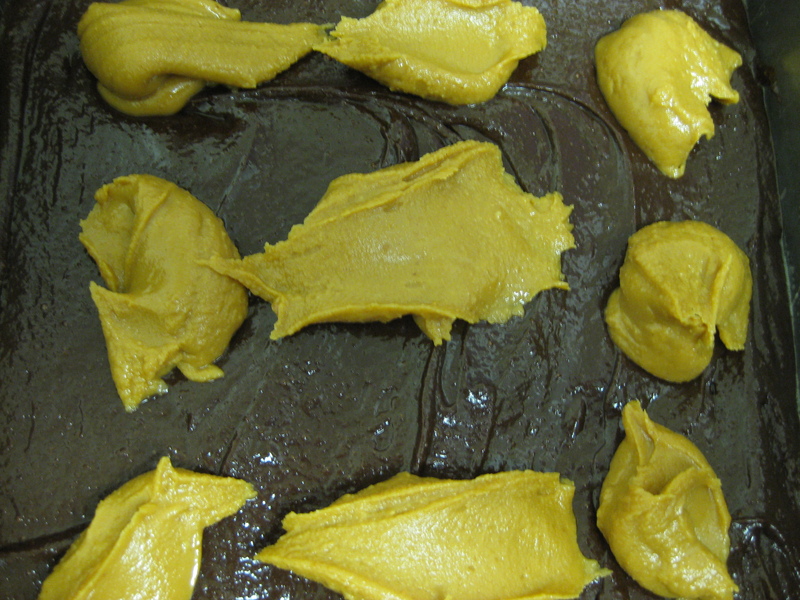 of peanut butter into the pan of brownies, 3 globs per row. 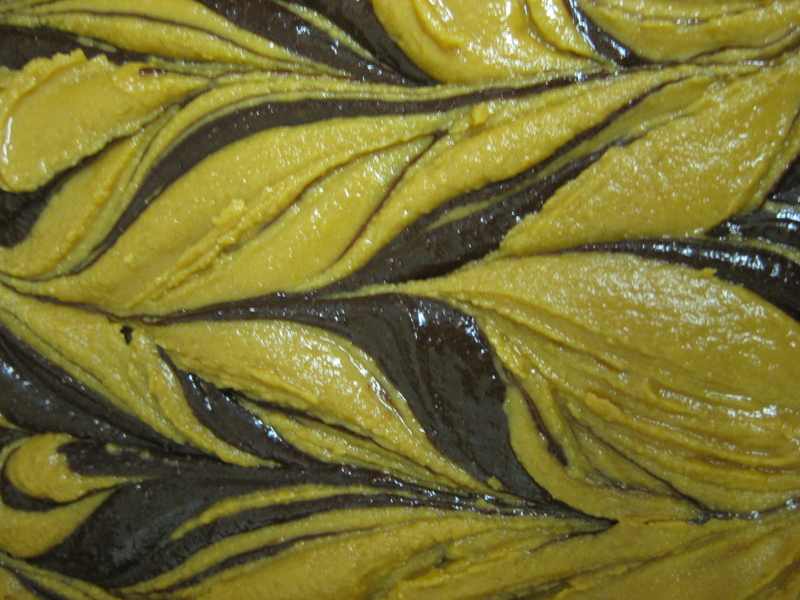 In order to create the peanut butter swirl, take a knife and drag it from top to bottom in the pan in right-side-up and then up-side-down “U-shaped” motion. Continue until you’ve done this vertically across the entire pan. Repeat this horizontally so that you’ve essentially swirled in both directions. Bake according to the instructions on the box, which for me was 38 minutes (I used a dark coated pan). Let the brownies cool completely and set aside. *Most recipes I reviewed say to avoid using natural peanut butter because it will separate in the churning process, and that’s definitely true. But, I really wanted to avoid using the processed stuff, and so I used the natural kind. 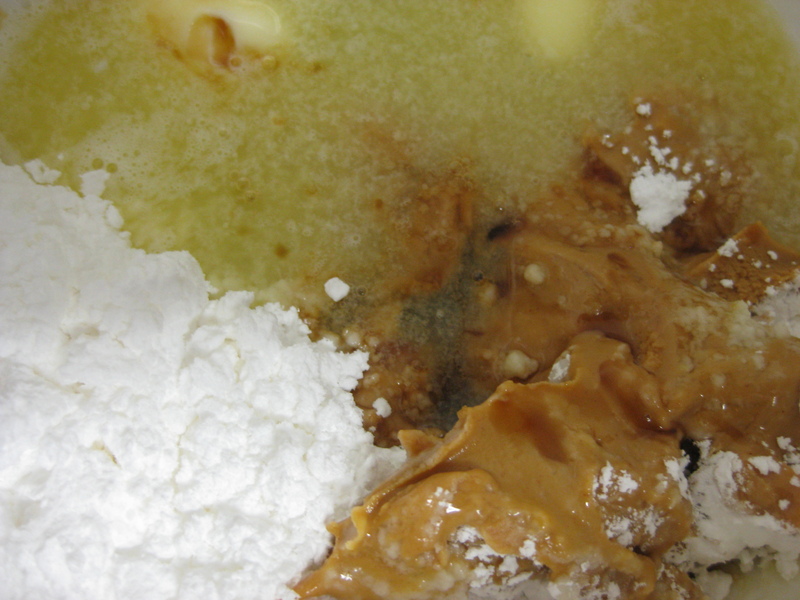 Be sure to stir the peanut butter very well before adding to the ice cream mixture so that the oil that is usually at the top of the peanut butter jar is entirely blended. Thoroughly mix all ingredients together using a hand mixer. The peanut butter will separate a bit, and the mixture will require a few rounds of mixing to ensure that all the ingredients are blended. Cool entirely before putting in the ice cream maker. Freeze the peanut butter ice cream according to the manufacturer’s instructions. For me, this was 20 minutes. Transfer to a storage container and put it in the freezer for another 2 hours to harden enough so that you can get the “perfect scoop” for the a-la-mode! To serve, cut the brownies into squares (you pick the size!) and serve with one to two generous scoops of ice cream. Enjoy! 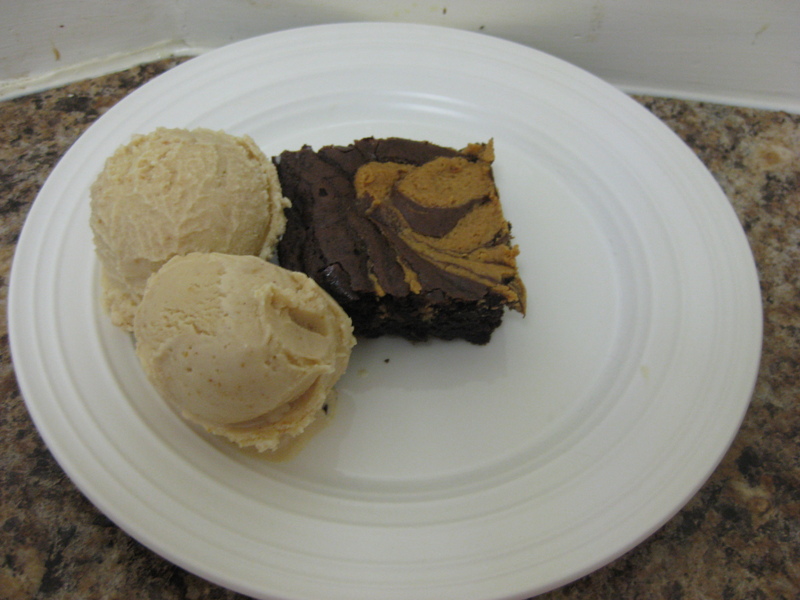 Peanut butter and fudge brownie a-la-mode! The Verdict: Tres Magnifique! Like I said, I don’t really like peanut butter much at all, and this was really good and creamy. The Brother-in-Law was pleased, which was the best part. If you recall, last time I made a peanut butter ice cream The Husband remarked that it was “too peanut-buttery”. This time he said it was perfect. Big relief. i came across a recipe the other day for a chocolate ice cream with caramel added to the base (not a swirl, an actual chocolate caramel ice cream). I think it’s too rich for me. You want it?